After being invited to the 1st Anniversary and blessing of Nailogy, I decided to try out their hair coloring and treatment services. I needed a change, I was dying my hair blonde for the past few months and having to update my roots every month was becoming costly and time consuming. So I decided to go with a sorta ombre look with black roots which is not such a popular common request in the Philippines. I didn't wash my hair before going the Nailogy which is advisable since if you use conditioner the color will not penetrate your hair strands. My hair was first dyed black at the roots and then it was rested for a few minutes, then rinsed. My hair ends had to be bleached, I wanted purple roots yet the color wasn't available so I chose this ash violet color instead. Bleach was applied and left in for a few minutes again to wash out any dark color and rinsed with only shampoo. Just bleached. Sorry for the no make-up look. Hehe. The violet ash color was then applied and left in for another few minutes, then rinsed. This was when the Keratin Treatment was applied and my hair was wrapped in cling wrap and rested for almost an hour. All in all it took almost 4 hours to complete the process. And here is my hair after.. tadaahhh! I was a little sad that the ash violet didn't appear as I had expected but I was still happy that I now had black roots which will make it so easier for me to maintain. 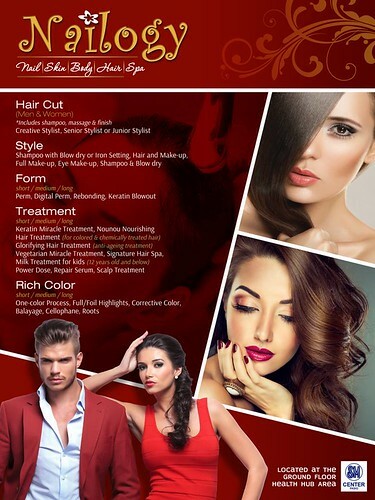 Here is a list of their hair services , prices depend on the length of the hair and you need to consult with them to get the exact amount. • Stylist - Neri is very entertaining and he knows what to do with your hair. Although, he is categorized as a Junior hairstylist he actually has a lot of past experience. • Team Work - they completely showed how the help out each other, even the attendants who do not have customers help out with washing our hair so you aren't waiting around. Ms. Cristina always checks on clients and asks how each is doing making sure that the service is being provided well. • The Keratin Miracle Treatment - My hair is totally softer than before, my hair was getting frizzy because of all the bleaching but after the treatment it felt and still feels soft to the touch. • Color choices - Most of the colors I wanted where not available like the shades of purple. Would I got back? Yes of course, and it is mainly because everyone is so friendly, it's like having your BFF do your hair and also the convenience of having all the services done in one place is so great for time conscious moms like I.